Home to hundreds of millions of people, the water-scarce semi-arid regions of Africa and India are particularly vulnerable to climatic and non-climatic impacts and risks. Across the ASSAR study sites, we have found that these risks affect different aspects of food security, and often in gender-differentiated ways. This brief* summaries the main stories and lessons from this area of ASSAR's work. *Download the full text from the right-hand column. Can people buy or obtain enough food? In Bangalore, India, migrants don’t always have the purchasing power to access food. To cut their costs, they often end up skipping meals. People’s aspirations can affect their food security. For example, many people want to invest in their children’s education to give them better opportunities in life. But strategies to achieve these investments – such as farmers in Kenya growing cash crops in addition to their food crops - can be risky, and can reduce the availability of food. In Botswana, the shift to cash cropping decreases women’s agency over their nutritional choices. In patriarchal households in Mali, and based on how decisions around food are made, some household members – like younger women – are more food insecure than others. Does food preparation ensure nutrition? In semi-arid areas, the scarcity and expense of clean water can affect people’s health and nutrition. In Kenya, people sometimes compromise on hygiene to minimise their water use. In Ethiopia, where invasive plants and sugar cane plantations have greatly reduced water availability for pastoralists, the water that is available is used for many purposes (drinking, washing, etc.) and is of poor quality. Is enough quality food available? In Ghana, dry spells and rainfall changes diminish crop yields and cause crop failures. In Mali, seed commercialisation reduces the availability of improved seeds and food grains for subsistence farmers. In Ethiopia and Kenya, pastoralists experience malnutrition and hunger as droughts force a shift in diet from meat and milk, to rice and potatoes. 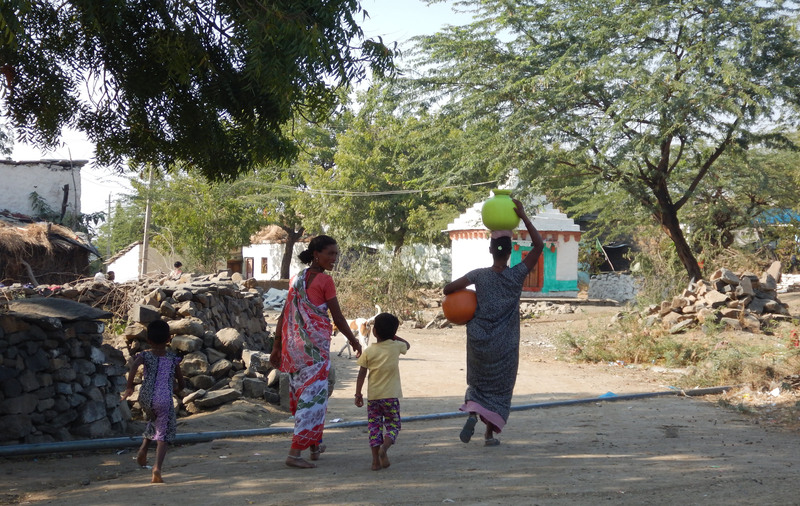 In India, shifting cropping patterns (from food and fodder crops to high-value perennial cash crops) driven by unregulated groundwater extraction, lead to people following less nutritious diets and becoming increasingly dependent on government food aid. In Namibia, changing rainfall patterns and high temperatures have led to inadequate yields of mahangu (pearl millet) and other crops and caused agro-pastoralists to shift their diets towards maize, rice and other purchased food. Is food available over time? Often, subsidies that help people shift their farming practices can have unintended long-term consequences on food security. In Tamil Nadu, India, a subsidy-driven shift to cash crops has made people dependent on water that is simply not available. For many, the resultant reduction in available water has made the area unliveable and forced people to pursue non-agrarian livelihoods in urban and peri-urban areas. This shift has also meant that these once-productive farmlands can no longer provide crops for export, with subsequent effects on India’s national food security. In Namibia, increasing drought frequency and poor rainfall threatens the Kolonkadhi and Ndongona drought-preparedness strategy that secures long-term (more than 2 years) yields of their food crops. For other groups like the Dhemba, long-term food availability is constrained by insufficient traditional knowledge of seeds (when to plant based on rainfall, how to store them), and by inadequate social support and finance. Are food security challenges gender-differentiated within households? Understanding the behavioural aspects of food security is critical in the African context where subsistence agriculture remains embedded in social systems and includes the dynamics of households, extended families, and communities. This example from Mali illustrates how, when it comes to food security, young women’s labour and time are disproportionately affected by the decisions of other household members. In the Koutiala district of southern Mali, rural young women are key to the household food security system. They pound millet, do field labour, collect water and firewood, and generate income (through commerce and off-farm jobs). Yet, the patriarchal nature of traditional Malian society can limit their decision-making power and affect their ability to carry out their designated tasks. For instance, as elder men control the use of farm equipment, young women must sometimes do their farm work by hand: “Weeding [by hand] is painful.”, says one young woman. Also, although young women must prepare food for the household, it is the elder women who decide what food should be prepared and how it should be distributed. Young women also have little ability to adapt to stressors outside of the household. For example, deforestation can force them to spend more time gathering firewood; but as they have limited time available for this task, they sometimes resort to buying firewood, or using less firewood for their everyday tasks. All of these stressors increase their work burden, while simultaneously reducing their abilities to contribute to daily household functions. These factors make young women (and by extension children, which are largely under their care) more vulnerable to the challenges of food security than other demographic groups. This suggests the need for future policy programs to specifically focus on the needs of young women so as to expand their access to resources and increase the range of adaptation behaviours available to them. Integrate both biophysical and socio-cultural issues when addressing food security, and challenge the social norms and patriarchal customs that discriminate against women. Consider the long-term impacts of subsidies and incentives on food security and nutrition. Although these can offer a crucial safety net in some instances, an understanding of local socio-ecological contexts and socially-differentiated needs should guide their use. Incentivise the local production of nutritious crops to increase yields and reduce dependency on food imports and aid. Furthermore, to avoid malnourishment, make men, women and the youth aware of the micro-nutrition of cereals and millets. Consider the need to maintain culturally appropriate foods when addressing the resiliency of food security systems. In particular, consider women’s traditional knowledge of seed management and crop selection. Rather than only providing or subsidising farm inputs, build additional capacities – particularly of young men and vulnerable women – to effectively use these inputs and develop farming strategies. ASSAR (2018) The gendered challenges of food security: Stories and lessons from ASSAR. This article describes ASSAR's method for what global warming of 1.5°C and higher means for the semi-arid regions of Botswana, Namibia, Ghana, Mali, Kenya and Ethiopia. This page collects together key messages and outputs from the ASSAR project relevant to global warming of 1.5°C and higher. This infographic illustrates the potential impacts of global warming of 1.5°C and above on the local climate extremes and vulnerable sectors of Namibia. This infographic provides insight into the impacts 1.5°C and higher of global warming will have on local climate extremes and the vulnerable sectors of Botswana. This infographic illustrates the impacts global warming of 1.5°C, and above, will have on the local climate extremes and the vulnerable sectors of Mali. This infographic illustrates the increasing impacts global warming of 1.5°C (and each further 0.5°C interval thereafter) will have on local climate extemes and vulnerable sectors in Kenya.